Any parent who is potty training a child will tell you that accidents happen. And when they do, you need to be prepared. Overreacting to a child's mishap may cause a relapse in toilet training, undoing months of good habits in the blink of an eye. Your child looks to you for validation and uses your behavior as his example. If you react to his mistake with a calm attitude, you will build his self confidence, and with it, his self esteem. On the other hand, if you freak out, your child will learn that it's not okay to make mistakes because making mistakes causes your anger. We all make mistakes, and we need our children to know that it's human to err. Your children need to know that you will always be there to give them unconditional love and support, no matter what mistakes they may make. In this way, you teach children how to be good spouses and parents. Stay Cool-Take a deep breath and remember that your kid isn't out to get you. He had an accident. He's not trying to mess up your day (only his pants?). He's probably embarrassed about his accident; he doesn't need you to make him feel worse. Say something encouraging, like, "Maybe you forgot to go to the potty, but next time you'll remember to get to the bathroom, fast." 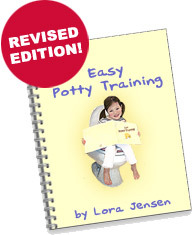 Don't Be Hasty-Teach your child not to jump up the minute he urinates. He might find that if he waits, there's still more urine to be voided. Emptying the bladder all the way can help keep him from having accidents. Ahem-Remind your child to go to the potty or toilet at regular intervals, since a child may hold back from urinating or having a bowel movement if he's engrossed in play... until it's too late and he has an accident. Show him that he's fidgeting or clutching himself. Ask him to make at specific times, such as before bed, or a car trip to instill good toileting habits. A State of Readiness-Always be prepared with dry clothing in case of accidents. If you're ready, your child will feel more secure in the knowledge that accidents happen, and you're ready to help him when they do.